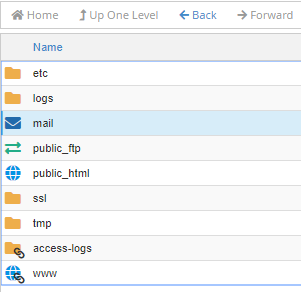 cPanel File Manager is a tool that enables you to manage your files directly within cPanel without having to use FTP. It enables you to create, upload, modify or remove files. 2. Scroll to the Files section and click on File Manager. 4. When you first use File Manager, you should click on the Settings icon (top right corner) to specify its default settings. This allows you to select the directory which you want File Manager to open by default. 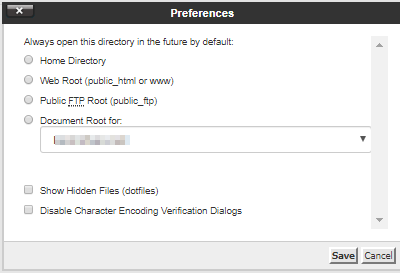 It also lets you enable the Show Hidden Files (dotfiles) option which will display the files whose name start with a dot (. ), such as .htaccess. 5. Click the Save button when you have made any changes. 6. The tools you need to manage your files are displayed in the ribbon at the top of the File Manager page. 7. If you wish to make any changes to an existing file or folder, you will need to locate it in File Manager and select it, so it is highlighted, like the ‘mail’ option below..
Once this is done, you can use the relevant tool to carry out your desired actions.